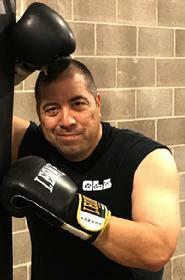 Travis Glenn is unusual in that he understands boxing and martial arts, AND he also understands how to TEACH them to new students. The problem with most boxing gyms and martial arts schools is that, while the staff may be skillful at boxing and martial arts THEMSELVES, they don’t really understand how to teach the skills to someone ELSE. Keep in mind that doing something yourself, and teaching it to others, are two very different skillsets. Just because you’re a world-class pianist does NOT automatically mean that you can teach someone ELSE how to play the piano. Just because you’re a world-class boxer does NOT automatically mean that you have the teaching skills to make someone ELSE a good boxer. The “copycat” approach, or “do-the-same-as-I-do,” is NOT a valid teaching approach. Yet it’s the teaching method that most boxing schools use. Think about it: if you could already copy the moves, you wouldn’t NEED a teacher, would you? Travis understands how to teach. In his previous career in educational documentation, he had to clearly convey concepts through a structured, guided approach. In his previous career as a professional musician, he had to teach theatrical songs to actors who were often not singers themselves. Travis also understands boxing. He has seriously trained since 2000 with FBI agent Dan Gonzalez in Dallas and has been teaching his own students since 2005. Using a structured “building-block” approach, Travis guides your body through the proper boxing movements and techniques. Much time is spent fine-tuning body mechanics and motion analysis. Not only does your body feel why each movement is correct, but your mind also UNDERSTANDS why each movement is correct. Travis teaches in a positive and reinforcing manner. The lesson atmosphere is one of joyous discovery. You leave each lesson feeling proud of the new things you’ve learned. Your body has had an invigorating physical workout. Your mind is clear and energized. Who knew that learning boxing could be so much fun? Chuck teaches in English and French. Mark Jarouse has been with Oak Lawn Boxing since its 2005 beginning, training with Travis Glenn in the much venerated “garage days.” Mark stresses a holistic approach to training as a mechanism to balance mind, body, and spirit, and to have the benefits of training, discipline, and self-respect permeate all aspects of one’s life, both personal and professional. He emphasizes technique, cardio, core work, conditioning, strength training, and nutrition all as equally fundamental aspects of his personable, positive, and collaborative training style. 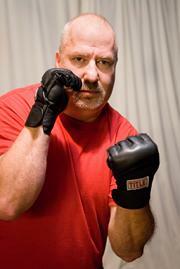 Mark provides instruction in boxing, freestyle wrestling, and submission grappling. Oak Lawn Boxing since 2009.
when teaching his boxing students. Jeff Jacklin (Official Gym Artist) has created TV storyboards, animatic art, comic book art, and game art. Major professional credits include Fox TV’s Spiderman and game versions of various Beatrix Potter books. Arizona Governor Janet Napolitano recognized Jeff for designing the Homeland Heroes certificate and logo for the families of soldiers. 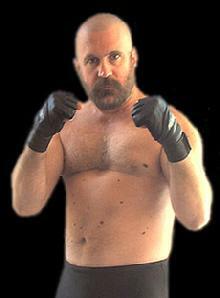 Jeff is also a martial artist who has trained and competed in both Kung Fu and Tae Kwon Do.